The Fulbright Program aims to bring a little more knowledge, a little more reason, and a little more compassion into world affairs and thereby to increase the chance that nations will learn at last to live in peace and friendship. Kimberley Leahy, an FSU doctoral candidate in the Department of Communications, has received a prestigious Fulbright Scholarship to Lithuania. She will use her award to study telecommunications policy transitions that have occurred since Lithuania became a member of the European Union. She will spend the first six months of 2006 at Vilnius University, Vilnius, Lithuania. Florida State University has produced 22 Fulbright Scholars since 1985. Leahy has presented her research on telecommunications policy in the United States as well as at international conferences in Ireland, Finland and Lithuania. She is this year's College of Communication's Graduate Student Teacher of the Year, and an Associate of the Program for Instructional Excellence at FSU. To earn her Fulbright Scholarship, Leahy wrote a research proposal outlining her plans for data collection and the goals she has set for her time abroad. She defended her proposal before a panel of FSU professors. Her proposal was subsequently accepted by both the U.S. Fulbright Scholarship board and the country of Lithuania. 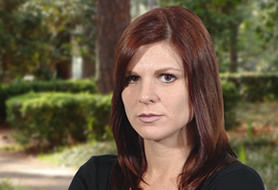 Prior to coming to FSU, Leahy worked for CCH, Inc., a research publishing firm, where she was a member of the CCH President's Roundtable, a recognition of excellence within the firm. She earned her M.B.A. from St. Joseph's University and a Bachelor of Science degree in Marketing from Indiana University of Pennsylvania. She is a Rotary International Paul Harris fellow. As part of her research preparation, Leahy traveled to Lithuania in the summer of 2003 to learn the Lithuanian language. The Fulbright Program is the U.S. government's flagship international educational program. It is designed to "increase mutual understanding between the people of the United States and the people of other countries…." According to founder J. William Fulbright, "The Fulbright Program aims to bring a little more knowledge, a little more reason, and a little more compassion into world affairs and thereby to increase the chance that nations will learn at last to live in peace and friendship."